Enjoy our all-ages, communal setting complete with shelves of board games, fooseball table, and pinball tables. 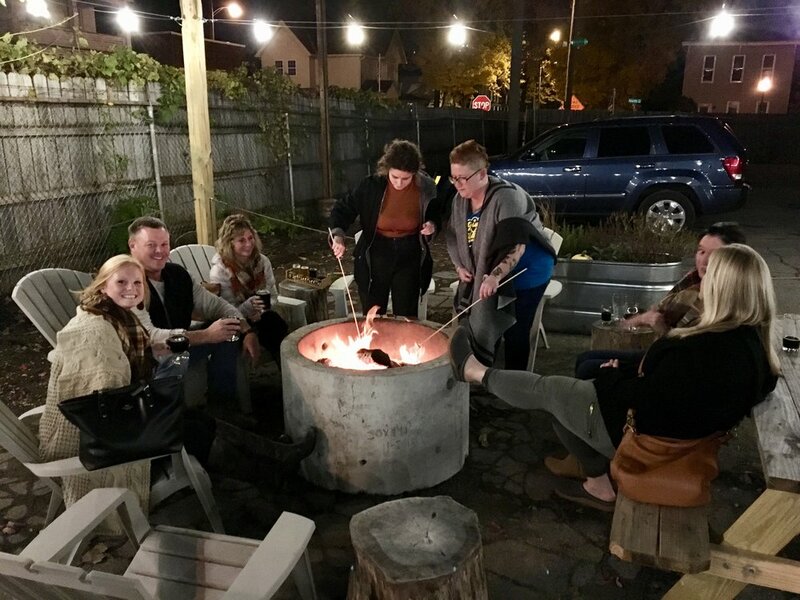 You can explore our lively outdoor patio with picnic tables, fire pits, and corn hole. We have various events happening inside our taproom and outside on our patio throughout the year. Check out our Events page for what’s happening today! Not sure what to order from our beer or food menu? Ask one of our taproom bartenders to assist you out. We love helping people try various beer styles to find a new favorite. Have a question about the brewing process? Just ask and we can show you through our windows directly into our brewhouse or take you on a tour, if possible. You never know, you might be sitting next to our brewer or one of the owners! Interested in hosting an event or gathering in our taproom? Let us help you coordinate it! For our catering menu, click here or email us at Info@HopRiverBrewing.com. Annual Mug Club Runs one year from the day of purchase. We BUY your first mug fill. Your first mug fill is included in the price of the membership. Discount on merchandise does not apply to Mug Club membership purchases. Mug fill on high-ABV house beers will incur an up-charge, which varies depending on the beer. No guest tap mug fills. No mug fills on limited release beers.